Vacuuming: some people love it, some people hate it, but ultimately, it has to be done. So why not make life easier by buying one of the best lightweight vacuum cleaners? They're ideal for those who have mobility issues, if you have stairs in your home or if you just want a vacuum cleaner that doesn't make you feel like you've done a full-workout after using it (we get it). For more of the best vacuum cleaners, we've got lots of recommendations. Find out more about how to choose a vacuum cleaner in our buying guide. See our latest vacuum cleaner deals, too. What is the best lightweight vacuum cleaner? In our opinion, the very best lightweight vacuum you can buy is the Dyson V8 Absolute. A great all-rounder, it's cordless, has a decent size capacity and power level and it can convert into a handheld for cleaning stairs. Scroll to see our pick of the best lightweight vacuums you can buy. Whether you’re looking for something easy to store, simple to use or to get in those hard-to-reach areas, there's a range of products to suit your needs. A lightweight vacuum is usually around or under the 5kg mark making them among the best vacuum cleaners for the elderly or those with limited mobility. They are also perfect in homes with lots of stairs to clean. Cylinders are usually the lightest option (other than handheld) and certainly the easiest to manoeuvre, as they are pulled along on their wheels, but upright vacuums can be easier to use if you have back problems and like to remain upright yourself, rather than bent forwards, as you would with a cylinder. If you're using a lightweight vacuum cleaner, you may also want to opt for a cordless vacuum; bear in mind that while convenient to use and often with a very decent battery life, these are not always as powerful as corded models. There are plenty of cordless models below or you can check our separate guide to cordless vacuums for the best on the market. Both cylinder and upright vacuums will usually come with a range of nozzle heads designed for cleaning different areas. Look out for bag versus bagless cleaning and check how easy it is to empty the cylinder. Cord length and retraction method is another feature to check out. Use our guide to find out how to vacuum like a pro. If you're mad on cleaning like us, head over to our cleaning product sourcebook to see our pick of the best 50 cleaning essentials. This Dyson can be used as a full-sized cordless vac or be converted into a handheld device for cleaning smaller areas such as the stairs or car, which in our eyes makes it the best lightweight vacuum cleaner for all round use. Considering its size and weight, it offers a huge amount of power thanks to that Dyson suction tech. The small dust compartment requires frequent emptying, especially if you have pets, but since it's bagless and pops open at the touch of a button when held over a bin, this really isn't much of an issue. It is super lightweight and just like all other Dyson vacs, it is kind to those with allergies and asthma. Dyson is known for its powerful vacuum cleaners, and this lightweight model is no exception. 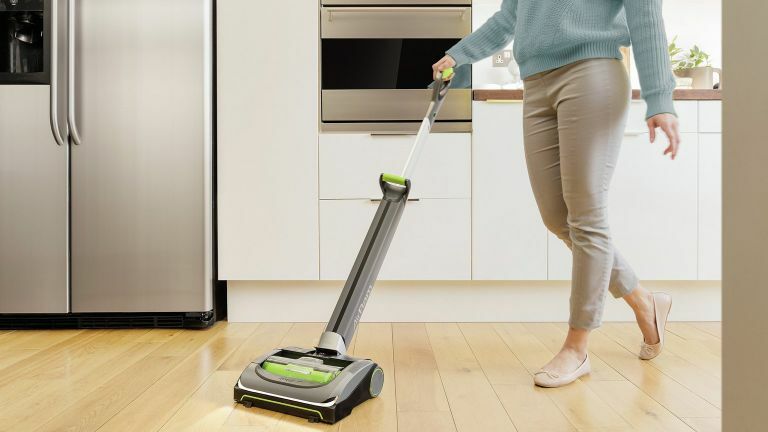 Coming in at just under 5kg, it is one of the heavier vacuums on the list, but if you’ve got pets then this is the must-have vacuum on the market right now. It really is one of the best lightweight vacuum cleaners for pets. This cylinder vacuum has an integrated filter which will eradicate pet hair and leave your home smelling clean and fresh, which makes a huge difference to those with allergies. While cleaning the long arm with telescopic extra reach is perfect for access anywhere you need – especially the stairs. The self retracting cable is super easy to use and makes for quick storage. The Miele C2 is not cordless, but is easy to move around and more importantly convenient to store if you don’t have much space. Suction power is impressive with a 1200W peak and maintenance is a lot easier than the similarly formed competition. Find more vacuums for pet hair in our buyer's guide. If you struggle to go from cleaning your living room carpet to your laminate flooring in the kitchen, this multi surface vacuum could be the one for you. This is one of the best lightweight vacuums for multi-surface cleaning. The AirRam MK2 is a cordless vac which makes it easier to go from room to room without sacrificing power. This also adapts to the different surfaces to remove dirt and dust quickly and easily. The vacuum is designed to compress the dirt to allow for even more storage, meaning fewer trips to the bin. Then when the time comes, the waste can be disposed of with no mess. There should be very few trips to charge this lightweight vacuum cleaner, too, as it has a hefty 40-minute battery life. The arm folds flat, which makes vacuuming under sofas and tables super easy even for those with back issues. The best lightweight vacuum for the elderly, we think. Those who struggle to get into hard-to-reach areas with their current upright vacuum could benefit from purchasing a second handheld vacuum to do the job. This is one of the best lightweight vacuum cleaners for the car. This Dyson handheld has awesome power and a great range of detachable tools which are perfect for all sorts of surfaces. This unit has two power settings to get the best clean possible while allowing you to maximise the battery life. It’s not a full-sized vacuum, of course, so if you need something lightweight to clean the entire house, then you might prefer to opt for the Dyson V6 for better versatility. But for cleaning the car, getting into tight spots or quickly cleaning up the dog bed, for example, this is ideal. Find more handheld vacuum cleaners in our guide. This little fella weighs under two and a half kilos, is super-smart and speedy and it'll have your home spotless in no time. It lives up to Dyson’s suction standards and is particularly good at removing pet hair from carpets. It’s a little slimmer than other robot vacuums, meaning it can get into tricky areas such as between chair legs and if it gets stuck it can even call for help. The Dyson 360 Eye maps the space around it to ensure it knows where it is heading and rarely bumps into obstacles as a result – hence that name. It also boasts excellent suction which, while it won't replace your upright vacuum, certainly means you'll have to do a major vacuum less frequently. Some may not like the idea of a robot vacuum and may prefer to do it themselves, as they aren't always the best at getting into corners. However, if you're after the best lightweight robot vacuum, this is your guy. Find more of the best robot vacuum cleaners in our guide. For those looking to go lightweight but not give up the traditional upright vacuum style, this vacuum has excellent performance and still comes in at just under 5kg. This is one of the best lightweight vacuum cleaners with a classic design. This vacuum offers great efficiency, and has an integrated HEPA filter which is perfect for those with allergies or homes with pets. Since this is bagless it means emptying and maintenance are super easy and even that is rarely done with the huge 1.5 litre capacity. The design isn’t cordless but this does make it more powerful, just make sure you have room to store it somewhere as it is a bit bulky. Thanks to a 13 metre cable length this will take on the whole house in most cases without the plug needing a move. We think this Morphy Richards lightweight vacuum cleaner is great value for money since it leaves floors feeling completely clean and fresh. In fact, it's one of the best lightweight vacuum cleaners for an affordable buy. It can be used as an upright or handheld vacuum and it is capable of picking up dirt in tricky areas as well as removing stains from your carpet. You have a range of nozzles including an upholstery tool so you can even clean furniture and curtains. The 20-minute battery should take care of most jobs and a recharging cradle makes for easy recharging and storage. The swivel head makes this manoeuvrable so even that battery life should be enough to zip round most homes quickly before needing a charge. If storage space is your main concern then this cordless and bagless vacuum is slim and compact when not in use. This is the best lightweight vacuum cleaner for storage, in fact. It comes with a few different nozzles for versatile cleaning abilities and four different power modes for whatever level of cleaning is required. The unit extends out for access to harder to reach areas and is light enough to be held up for higher spots too. Similar to many lightweight vacuums, this one has a very small capacity that needs emptying after vacuuming each room, but if you only have a small home and vacuum little and often, then this could be the vacuum for you. Find more small vacuum cleaners in our guide. On a budget but want a new vacuum cleaner that is as light as a feather? Opt for the Bush V8211. Although it may look like a cordless vacuum, it has a 5m long cord which is plenty long enough for cleaning a couple of rooms at a time. An excellent choice for flat-dwellers or as a second vacuum for upstairs, it comes apart completely so that it can be easily stored away in a small space. Though it's light, it doesn't lack power, and thanks to its HEPA filter it'll trap small particles and pet hairs, making it ideal for allergy sufferers. It also has an adjustable floor head and comes with a crevice nozzle and a dusting brush. We like. Find more cheap vacuum cleaners on our vacuum cleaner deals page. Powerful and practical, this lightweight vacuum cleaner is ideal for pet owners as it features two interchangeable heads for a professional clean: a PowerPlush head to pick up hair without clogging; and a Turbo head for a deep clean. The machine has a one touch power button and an indicator light for real-time battery status, and it can be easily manoeuvred around your home and upstairs thanks to its self-propelled motorised nozzle and swivel steering. For us, the best part is that it's super lightweight at just 5.5lbs, meaning it can easily be used in conjunction with the extension wand and lifted to reach hard-to-clean spots. One of the best lightweight vacuum cleaners for those with allergies as well as pets, we think.